Nazan Azeri is memorializing her mother with a series of painting, photography and video. Her mourning is reflected on her mother’s wedding dress, very likely the last piece of memento. The wedding dress is displaced in a heavy wind, as it is mysteriously floating on the branches of a tree. The poetic ensemble of work exploiting the wedding dress-traditionally the symbol of virginity, virtue and innocence- as an indicator, is an elegy for women violations in Turkey. In Azeri’s exhibition agenda since the beginning of 1990s when she decided to be an artist after studying law, there are mainly research based works dealing with themes of gender, imposed social roles and Turkey’s political deadlocks that invade the life and influences the decisions of individuals. 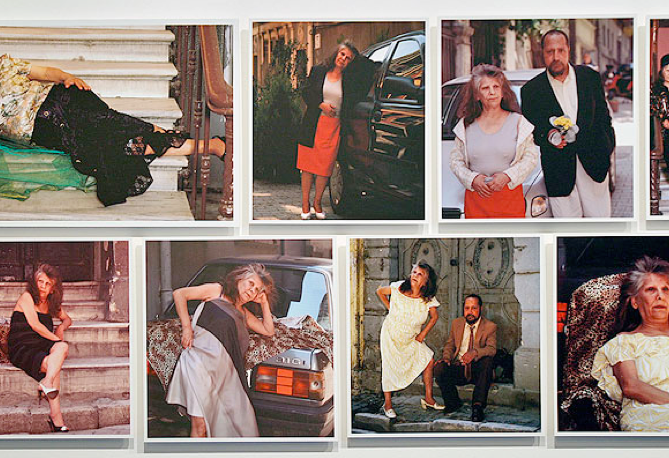 In her 2005 work of photography Dream Roles she invited the Yeşilçam (the film industry street in Beyoğlu district) veterans to pose with second hand dresses, which she collected since 2002. Most of the people of this group are full of memories of the glorious days, when they were popular as extras in Turkish films, but now they are homeless or marginalized. With this documentation Azeri not only evoked awareness on the tragic knock-on effects of Turkish cinema industry that has defined and determined the dreams of many generations, but also questioned ever growing poverty of marginalized groups within the neo-liberal economy that designates the human being as consumer and discards the ones that cannot consume.